The surprise of spring in Ithaca, New York is color. Winter’s tones here are the off-whites of the sky, the greys and browns of bark, and the beiges of field stubble and beech leaves that shiver all through the season. Sometimes there’s a blue sky, in the shade that my mother always called copen-blue. Copen? To prepare you for what lies ahead in the way of my attempts at slightly nuanced color descriptions, I provide a definition of the color “copen” : “a variable color averaging a moderate blue that is redder, lighter, and stronger than pompadour, bluebird, azurite blue, or Dresden blue and greener, lighter, and stronger than luster blue” (Merriam-Webster’s online). A ha! I thought so. Recently, taking a walk around the block with my dog, I stumbled into a swath of pink-flowering shrubs. I felt as if I was seeing pink for the first time. 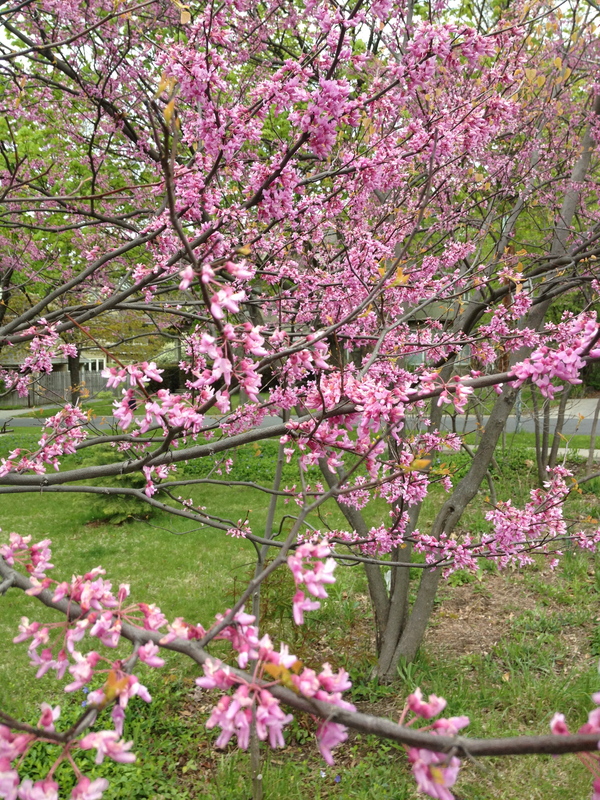 Suddenly, in a short section of sidewalk bumpy with tree roots and littered with the odd soda can and wrinkled dusty plastic wrapper, I was rubbing shoulders with spring pink in four shades —the redbud (Cercis canadensis) and lilac (Syringa sp.) to my right, and the dogwood (Cornus florida rubra) and honeysuckle (Lonicera sp.) to my left. Redbuds are one of the glories of eastern North America. Its pink is unique and mysterious, especially as the flowers are clustered tightly against the grey bark and appear well before any leaves. Often called a rosy pink or a purple-pink, it is definitely more complex than such simple names suggest. I would call it a French-blue pink. There’s a hint of blueberry in its shade, and in fact the hooded little pea flowers can only be pollinated by long-tongued bees, such as blueberry bees and carpenter bees. 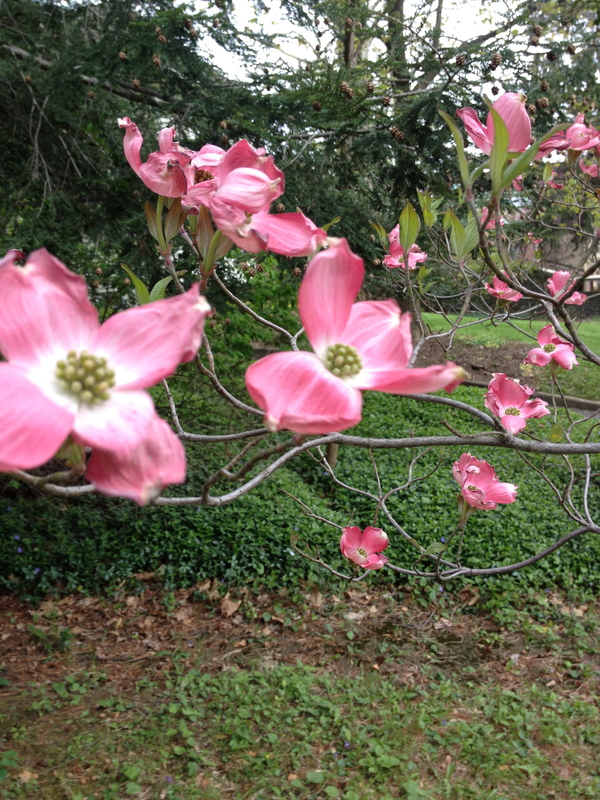 The pink-flowering dogwood is a peachier, orangier pink. Perhaps with a tinge of apricot. I would like to offer my pink descriptions with the same beguiling eloquence as those writers of wine descriptions. Continuing in that vein, perhaps I could add that the dogwood’s pink has a hint of apple? 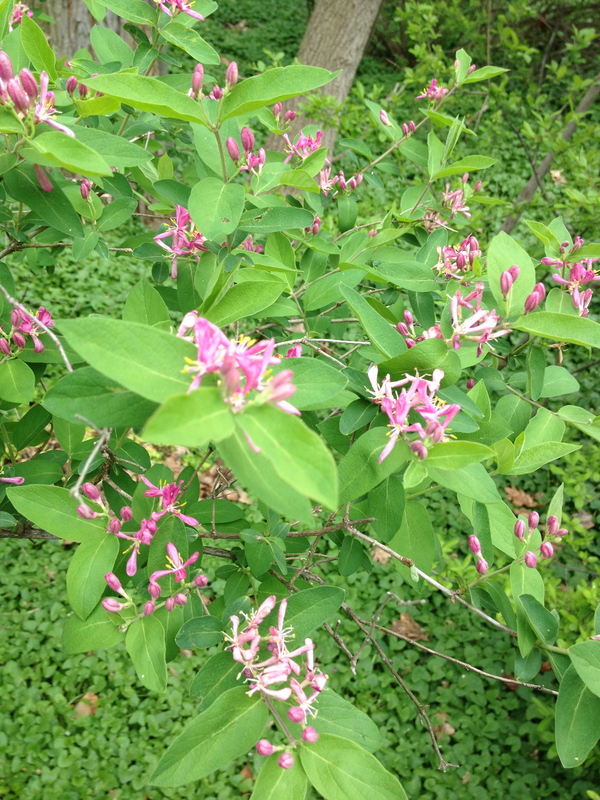 While there are those who consider the honeysuckle weedy, old fashioned, and invasive, various bushes in my neighborhood offer pinks that vary from pale, uncomplicated pink to a coppery sort of pomegranate pink. 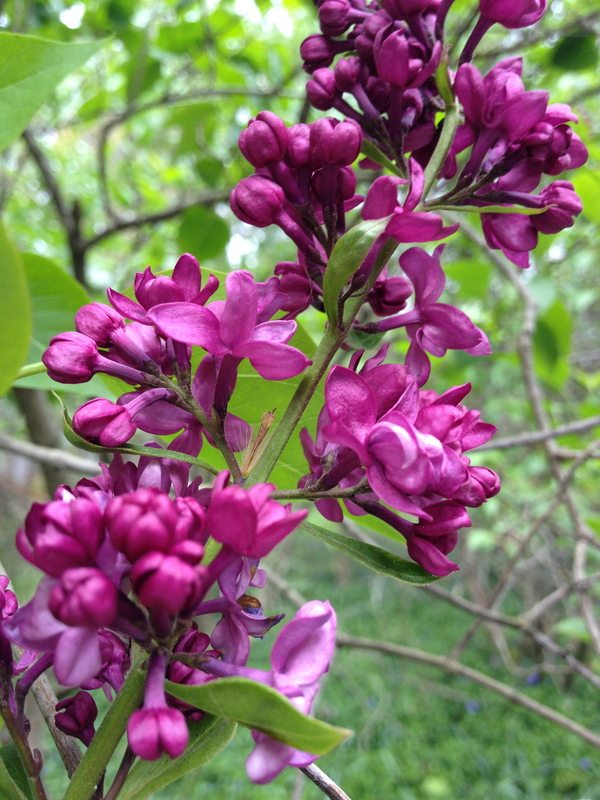 Some may criticize me for including the lilac in my cast of pink-hued characters, however a lilac in bud is pinkish-reddish rather than lavenderish (and lilacs are often in an between state, half in bud and half in full flower). We enjoy these shades of pink courtesy of chemical compounds called anthocyanins that can be present in all parts of a plant, but are particularly apparent in flowers, which contain little to no chlorophyll (the compound that makes the plant kingdom green). Such colors protect plants from sun stroke, signal pollinators, and offer diners antioxidants. In comparison to anthocyanin, pink is a lovely word. It has the soft, comforting sound of the letter “p,” and the zippy verve of the letter “k.” According to etymologists, it is an old word whose first use occurred between 1565 and 1575, but its origin is unknown. At some point its history became connected to a garden flower known as the cottage pink or China pink, belonging to the Old World genus Dianthus, whose flowers come in various shades of white-speckled pink and red and have frilled edges–thus the naming of pinking shears. How nice to take a walk around the block, thinking about different shades of pink, practicing the art of discernment! 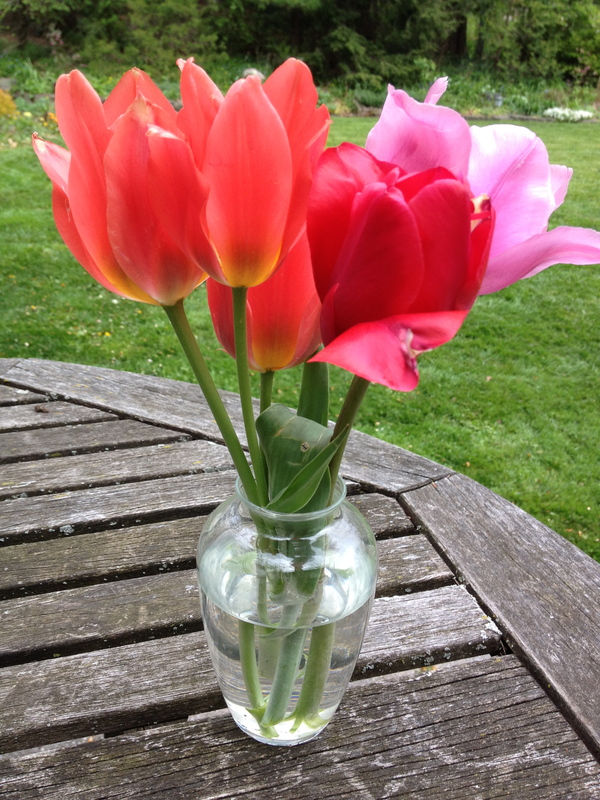 Enthused with this bit of fieldwork in the neighborhood, I came home to my garden and made a bouquet of tulips in different hues of rose to continue my exploration of spring’s pinks under a copen-blue sky.